Bill Brown -- Bill's located in Utah and restores Kaiser Frazer automobiles. Jim Brown--Jim is a long time KFOCI member and he currently has a nice 53 Corsair! Mark Chapman is new to the club and he's restoring a nice 55 Willys. Doug Eilers has 19 photo albums with cars primarily from the Northwest and some models at two locations: Albums #1 . Mano Forsman is a fellow KFOCI member who lives in Sweden. Check out his web page! Claes Hermansson owns a couple of Kaisers. He hails from Sweden and has done a fine job of restoring his cars! Dave Hollen has been a Kaiser collector for many years. He lives next door to his uncle's former KF dealership. Some guys have all the luck! Chuck and Betty Hucker from Indiana share a website for both of their hobbies. 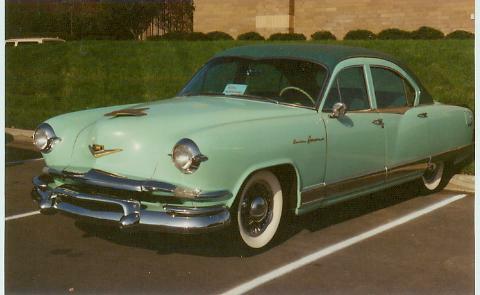 Chuck plans to restore his 1955 Kaiser, the last one to come off the production line in Toledo, Ohio. Tom Morganti--Tom lives in New England and built a 1949 Frazer Manhattan hardtop. KF didn't build an "official" one, but Tom did! Take a look. Randy Owen--Randy and wife Nell are active in a number of car clubs. Randy has been the prime mover behind getting the KFW Chat Group organized at The Auto Channel. Visit the KF chatters using the message boards under the 'Chat' link. Larry Stradt--Larry has Kaisers, Henry J's, Studebakers, and cats as pets! Larry also has photo albums for 1947-55 Kaiser-Frazer (more than 900 pics), 1951-54 Henry J (more than 450 pics), 1952-53 Allstate (more than 60 pics), Aero and Willys (more than 375 pics). Tom Stradt--Tom (known as Henry J on the chat circuit) has Kaisers, Henry J's, Studebakers, and computers as his pets. He was recently elected Vice President of the KFOCI. Tom has several photo albums with pics of assorted cars and car meets. Tom Turner--Tom has a Traveler that he's justifiably proud of and he lives in upstate New York. Allan Vetter -- New members Allan and Phyllis have a webpage dedicated to the restoration of their Kaiser. Take a look! Ben Walker--Ben has a site dedicated to his KF literature collecting hobby. His goal is to have pictures of all KF (and some Willys) sales literature. Ben is currently Manager of the Souh Central Region of the KFOCI. 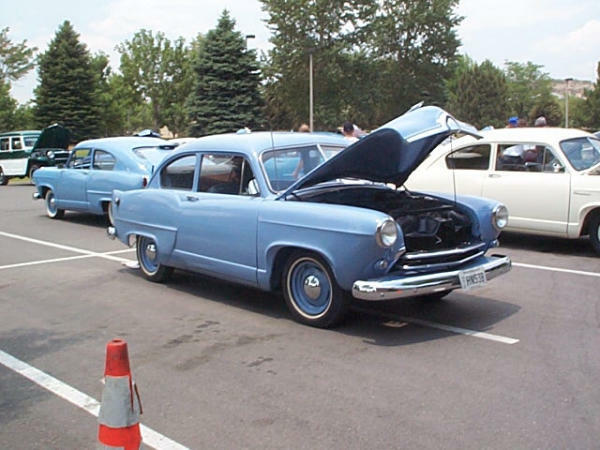 Tom Wilson--Tom and others are organizing a new group for Kaiser-Frazer enthusiasts in Michigan. Not yet affiliated with KFOCI, but the organizers are all KFOCI members. Tom has photo albums available for your viewing pleasure of the Amp Car Project and for the Frazer Fraternity. Also available is Tom's collection of photos of the Ypsilanti Heritage Collection.